Hebron/Al-Khalil Old Town is a well-preserved urban fabric that developed during the Mamluk and early Ottoman periods. 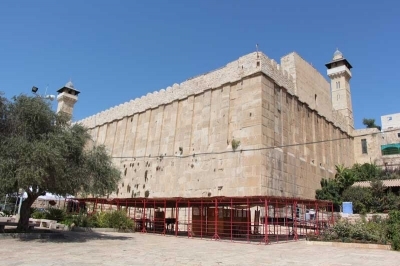 The town developed around the Cave of the Patriarchs / Sanctuary of Abraham / Ibrahimi Mosque, a compound dating to over 2,000 years ago and associated with the Holy Books Torah, Bible and Quran. We rented a taxi for the day to visit Hebron from Bethlehem. This proofed to be a good choice, as we were driven close to the mosque/tomb, with instructions on how to reach it. The place itself is one of the strangest visit I ever had. It is divided, but if you are neither Jew nor Muslim, you can enter both sides, passing the respective checkpoint. I suggest visiting both sides, as each one has a special advantage. The Jewish side is not really interesting inside, but the façade is very photogenic from that side. The Muslim side is just a boring stonewall from outside but the mosque is very nice from the inside. The old town is around the mosque/tomb. It’s not bad, but a bit in lack of maintenance (like most of Palestine). It did not seem that the town has any tourist infrastructure. We felt like adventurers, discovering a lost city. However, there was no situation we felt unsafe. The whole experience beats the actual site itself by miles. No doubt Assif can update us more accurately than I can regarding the complex realities of Israeli/Palestinian control across various parts of the City of Hebron. We visited the Israeli controlled area for a few hours, both to see the Tombs of the Patriarchs but also to try to get a feel for the situation. In that short visit I am unlikely to have fully understood matters but will do my best to describe what I can only describe as “a very strange visit”. In common with some other entries on the Palestinian T List, that for Hebron represents possibly a statement of hope but more realistically, one of political posturing made in the face of a rather different reality in which the Palestinian Authority is not in control of the site and indeed seems less and less likely ever to be so as time passes - even if it is de jure within “Palestine”. 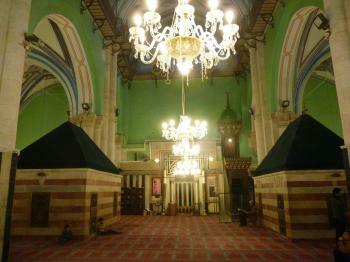 At the heart of it all lies the “Tombs of the Patriarchs” or, to Muslims, the Ibrahimi Mosque. This consists primarily of a massive (originally open?) “enclosure” with 2 metre thick walls built by Herod the Great. Under it, in a cave, lie the supposed tombs of Abraham and Sarah, Isaac and Rebecca, Jacob and Leah. These are manifested above in the form of cenotaphs. The original structure has undergone several developments over the 2000 years – the creation of a basilica by the Byzantines, then a mosque, then building of another Christian basilica by the Crusaders and later a mosque again under Saladin. 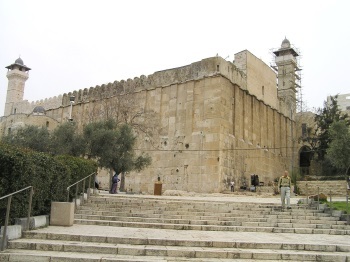 In 1967, after the 6 Day War, Hebron came under Israeli control but the Jewish community which had lived on there through the centuries of Muslim control had suffered both in the form of not, since 1227, being allowed to enter the building beyond “the Seventh Step” (at the outer gate) and in 1929 in the form of a “massacre” in their small (750 persons) historic community area. Israel determined early that, whatever land it might return in whatever kind of settlement might be made, this part of Hebron would not be a part of it. Ben Gurion is reported as saying that Hebron, 'is more Jewish even than Jerusalem' and "Jerusalem became Jewish three thousand years ago under King David. but Hebron became Jewish four thousand years ago under Abraham” (Wiki). Today, following special agreements regarding Hebron as an exception to the Oslo Accords, Israel maintains control over the area within which the Tomb stands, together with a salient of land deep into the heart of Palestine-controlled Hebron which is being populated anew by a Jewish community. Arrangements for control of the tomb itself are complex – there are 2 entrances at opposite sides, one for Jews and one for Muslims (but Muslims still have to pass through Israeli checkpoints to enter the area from Palestinian controlled territory). Certain rooms are under Jewish and others under Muslim control such that some of the tombs (Cenotaphs) can be seen through metal grids from either side but with bullet proof glass between them (In 1994 29 Muslim worshippers were shot dead inside by an Israeli settler). For each community there are 10 days set aside during which they, exclusively, can visit the other area to get a full view. As “Christians” we were allowed entry to both sides. I duly donned the kippah I was given in order to visit the Jewish side and afterwards we walked outside and round the building to the other entrance where my wife had to don a head and body covering robe. Both sides were very friendly but it was all very strange. Through the doors from the Muslim side could be heard the chanting of Jewish prayers from the other! The rooms on the Jewish side were rather makeshift and of no architectural significance but the main halls of the mosque displayed pleasing stone patterning as did the rooms surrounding the cloth covered cenotaphs. In the main prayer hall with the tombs of Isaac and Rebecca (Photo) there is a small grill which covers an entrance to the closed tombs. But you wouldn’t visit for an “architectural experience” – this is a place for religion or curiosity! Outside we went for a walk through the Israeli controlled area “H2” (having had our passports checked by a couple of the many soldiers present!) - along Shuhada St with all its shops forcibly closed down for security reasons since the 2nd Intifada, visiting the Jewish museum and on into the fortress-like new buildings of the Jewish Settlement. Thankfully the area was quiet while we were there and we saw none of the overt mutual provocation between the communities which has been reported and filmed but it was interesting to have seen this “raw frontier” in the Israeli/Palestine conflict. Ibn Battuta: "Next I travelled from Ghazzah to the town of al-Khalil... Its mosque is an elegant edifice, substantially built, of striking beauty and imposing height, and constructed of squared stones." Disputed territories: Lies on the West Bank. The city is divided into two sectors: H1, controlled by the Palestinian Authority and H2, roughly 20% of the city, administered by Israel. 41 Community Members have visited.